This article is about the city in Metro Manila. 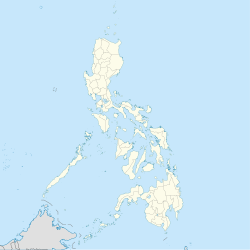 For the province in Calabarzon which does not cover the city, see Quezon. For the Philippine president from which the city was named after, see Manuel L. Quezon. For other uses, see Quezon (disambiguation). Quezon City (UK: /ˈkeɪzɒn/, US: /ˈkeɪsɒn, -sɔːn, -soʊn/; Tagalog: Lungsod Quezon [luŋˈsod ˈkɛson]; Spanish: Ciudad Quezón [sjuˈðað keˈson] ( listen); also known as QC or Kyusi) is the most populous and a highly urbanized city in the Philippines. It was founded by and named after Manuel L. Quezon, the 2nd President of the Philippines, to eventually replace Manila as the national capital. The city was proclaimed as such in 1948. However, since practically all government buildings are still in Manila, many functions of national government remained there. Quezon City held the status as the official capital until 1976 when a presidential decree was issued to designate Manila as the capital and Metro Manila as the seat of government. • Jorge John B. Banal Jr.
• Andres Jose Yllana Jr. It is the largest city in terms of population and land area in Metro Manila, the National Capital Region of the Philippines. Quezon City is not located in and should not be confused with Quezon Province, which was also named after the president. Quezon City now hosts a number of government offices, the most important of which are the Batasang Pambansa Complex (the seat of the House of Representatives, the lower chamber of the Philippine Congress), and the Quezon City Reception House (the current seat of the Vice President of the Philippines). Quezon City also serves as home to the University of the Philippines Diliman—the national university—and Ateneo de Manila University. The Quezon Memorial Circle is a national park and shrine located in Quezon City. The park is an ellipse bounded by the Elliptical Road. Its main feature is a mausoleum containing the remains of President Quezon and his wife, First Lady Aurora Quezon. Commonwealth President Manuel L. Quezon. Before Quezon City was created, its land was settled by the small individual towns of San Francisco del Monte, Novaliches, and Balintawak. On August 23, 1896, the Katipunan, led by its Supremo Andrés Bonifacio, launched the Philippine Revolution against the Spanish Empire at the house of Melchora Aquino in Pugad Lawin (now known as Balintawak). In the early 20th century, President Manuel L. Quezon dreamt of a city that would become the future capital of the country to replace Manila. It is believed that his earlier trip in Mexico City, Mexico influenced his vision. In 1938, President Quezon created the People's Homesite Corporation and purchased 15.29 km2 (6 sq mi) from the vast Diliman Estate of the Tuason family; this piece of land became known then as Barrio Obrero ("Workers' Village"). The National Assembly of the Philippines passed Commonwealth Act 502, known as the Charter of Quezon City, originally proposed as "Balintawak City; Assemblymen Narciso Ramos and Ramon Mitra Sr. successfully lobbied the assembly to name the city after the incumbent president. President Quezon allowed the bill to lapse into law without his signature on October 12, 1939, thus establishing Quezon City. When Quezon City was created in 1939, the following barrios or sitios: Balingasa, Balintawak, Galas, Kaingin, Kangkong, La Loma, Malamig, Masambong, Matalahib, San Isidro, San Jose, Santol, and Tatalon from Caloocan; Cubao, the western half of Diliman, Kamuning, New Manila, Roxas and San Francisco del Monte from San Juan; Balara, Barangka, the eastern half of Diliman, Jesus de la Peña and Krus na Ligas from Marikina; Libis, Santolan and Ugong Norte from Pasig and some barrios from Montalban and San Mateo were to be given to the new capital city. Instead of opposing them, the six towns willingly gave land to Quezon City in the belief that it would benefit the country's new capital. However, in 1941, the area within Wack Wack Golf and Country Club was reverted to Mandaluyong, and Barangka and Jesus de la Peña to Marikina. In addition, the land of Camp Crame was originally part of San Juan. On 1 January 1942, President Quezon issued an executive order from the tunnel of Corregidor designating Jorge Vargas Mayor of Greater Manila, a new political entity comprising, aside from Manila proper, Quezon City, Kalookan, Pasay, San Juan, Mandaluyong, Makati, and Parañaque. Greater Manila would later be expanded to include Las Piñas, Malabon, and Navotas. Imperial Japanese forces occupied Quezon City in 1942 during World War II. In October of that year, the Japanese authorities divided the City of Greater Manila into twelve districts, two of which were formed from Quezon City: Balintawak which consisted of San Francisco del Monte, Galas, and La Loma; and Diliman which consisted of Diliman proper, Cubao, and the University District. In 1945, combined Filipino and American troops under the United States Army, Philippine Commonwealth Army, and Philippine Constabulary, with help from recognized guerrilla units, liberated and recaptured Quezon City in a few months, expelling Imperial Japanese forces. Heavy fighting occurred near Novaliches, which at that time was in Rizal Province, and New Manila which was a strongpoint. Toward the end of the Battle of Manila, Pres. Sergio Osmeña dissolved the Greater Manila Complex, which included the Japanese-created districts of Balintawak and Diliman which had been formed from the prewar Quezon City. After the war, Republic Act No. 333, which redefined the Caloocan–Quezon City boundary, was signed by President Elpidio Quirino on July 17, 1948, declaring Quezon City to be the national capital, and specifying the city's area to be 156.60 km2 (60 sq mi). The barrios of Baesa, Bagbag, Banlat, Kabuyao, Novaliches Proper, Pasong Putik, Pasong Tamo, Pugad Lawin, San Bartolome and Talipapa, which belonged to Novaliches and had a combined area of about 8,100 hectares, were taken from Caloocan and ceded to Quezon City. This caused the territorial division of Caloocan into two non-contiguous parts, the South section being the more urbanized part, and the North half being sub-rural. On June 16, 1950, the Quezon City Charter was revised by Republic Act No. 537, changing the city's boundaries to an area of 153.59 km2 (59 sq mi). Exactly six years after on June 16, 1956, more revisions to the city's land area were made by Republic Act No. 1575, which defined its area as 151.06 km2 (58 sq mi). According to the Philippine Institute of Volcanology and Seismology and Geoscience Australia on their study earthquake impact and risk assessment on the Greater Metropolitan Manila Area, the total area of Quezon City stood at 165.33 km2 (64 sq mi). On October 1, 1975, Quezon City was the actual site of the "Thrilla in Manila" boxing fight between Muhammad Ali and Joe Frazier, which took place at the Araneta Coliseum. It was renamed as the "Philippine Coliseum" for the event. On November 7, 1975, the promulgation of Presidential Decree No. 824 of President Ferdinand Marcos established Metro Manila. Quezon City became one of Metro Manila's 17 cities and municipalities. The next year, Presidential Decree No. 940 transferred the capital back to Manila on June 24, 1976. On March 31, 1978, President Marcos ordered the transfer of the remains of President Quezon from Manila North Cemetery to the completed Quezon Memorial Monument within Elliptical Road. On February 22, 1986, the Quezon City portion of the Epifanio de los Santos Avenue (between Camp Crame and Camp Aguinaldo) became the venue of the bloodless People Power Revolution that overthrew Marcos. On February 23, 1998, Republic Act. No. 8535 was signed by President Fidel Ramos. The Act provided for the creation of the City of Novaliches comprising the 15 northernmost barangays of Quezon City. However, in the succeeding plebiscite on October 23, 1999, an overwhelming majority of Quezon City residents rejected the secession of Novaliches. Quezon City is the first local government in the Philippines with a computerized real estate assessment and payment system. The city government developed a database system that now contains around 400,000 property units with capability to record payments. In 1938, President Quezon made a decision to push for a new capital city. Manila was getting crowded, and his military advisors (reportedly) told him that Manila, being by the bay, was an easy target for bombing by naval guns in case of attack–a real possibility in the late 1930s. Military advisers, however, did not anticipate aerial bombardment. Quezon supported the idea of a new city at least 15 km (9 mi) away from Manila Bay (beyond the reach of naval guns). He contacted William E. Parsons, American architect and planner, who had been the consulting architect for the islands early in the American colonial period. Parsons came over in the summer of 1939 and helped select the Diliman (Tuason) estate as the site for the new city. Unfortunately he died later that year, leaving his partner Harry Frost to take over. Frost collaborated with Juan Arellano, engineer A.D. Williams, and landscape architect and planner Louis Croft to craft a grand master plan for the new capital. The plan was approved by the Philippine authorities in 1941. The core of the new city was to be a 400 ha central green, about the size of New York's Central Park, and defined by North, South (Timog), East and West Avenues. On one corner of the proposed Diliman Quadrangle was delineated a 25-hectare elliptical site. This was to contain a large capitol building to house the Philippine Legislature and ancillary structures for the offices of representatives. On either side of the giant ellipse were supposed to have been the new Malacañan Palace on North Avenue (site of the present-day Veterans Memorial Hospital), and the Supreme Court Complex along East Avenue (now the site of East Avenue Medical Center). The three branches of government were to be finally and efficiently located in close proximity to each other. The city lies on the Guadalupe Plateau, a relatively high plateau at the northeast of the metropolis situated between the lowlands of Manila to the southwest and the Marikina River Valley to the east. The southern portion is drained by the narrow San Juan River and its tributaries to Pasig River, while running in the northern portions of the city is the equally-narrow Tullahan River. Quezon City is bordered by Manila to the southwest, by Caloocan and Valenzuela City to the west and northwest. To the south lie San Juan and Mandaluyong, while Marikina and Pasig border the city to the southeast. To the north across Marilao River lies San Jose del Monte in the province of Bulacan, while to the east lie Rodriguez and San Mateo, both in the province of Rizal. The city can be divided into a number of areas. The southern portion of the city is divided into a number of districts including Diliman, Commonwealth, the Project areas, Cubao, Kamias, Kamuning, New Manila, San Francisco del Monte, and Santa Mesa Heights. The northern half of the city is often called Novaliches and contains the areas of Fairview and Lagro. Most of these areas have no defined boundaries and are primarily residential in nature. Quezon City features a tropical monsoon climate (Köppen climate classification Aw/Am), with prominent dry season from December to May, in which in turn, divided into cool and warm dry seasons, and a prolonged wet season from June to October that brings heavy rains in some areas. According to the 2015 Census, the population of the city was 2,936,116, making it by the most populous city in the Philippines. This figure is higher by more than 1.1 million from Manila, the country's second most populous city. The increase in population of the city has been dramatic considering that it was only founded / consolidated (and sparsely populated) in 1939. Quezon City became the biggest city in terms of population in the Philippines in 1990 when it finally surpassed the number of inhabitants of the densely populated City of Manila. Quezon City's population continued to increase and went on to become the first Philippine city (and as of 2017 the only city) to reach 2 million people (in the late 1990s). Population is projected to reach 3 million people between the 2015 and 2020 census years and 4 million people between the 2025 and 2030 census years. The trend is also seen in the significant increase in the percentage share of Quezon City to the total population of what is now called Metro Manila. Its share comes from a low of less than 10% in the 1950s to 21.0% in 1980 and then to 22.8% in 2015. Quezon City is predominantly Roman Catholic with roughly 90% affiliation in the population; Novaliches Diocese had a 90% Roman Catholic adherence while the Diocese of Cubao had a Roman Catholic adherence of more than 88% (Catholic Diocese Hierarchy, 2003). In 2002, Quezon City was made an episcopal see for two new Catholic dioceses: Cubao and Novaliches, as the very populous Archdiocese of Manila was carved up and five new dioceses created. A number of religious orders have set up convents and seminaries in the city. Various Protestant faiths have seen a significant increase in membership over recent decades and are well represented in Quezon City. While the Islamic faith has its largest concentrations in the south of the Philippines, there is a significant population in Quezon City. The Salam compound in Barangay Culiat houses one of the area's landmark mosques. Iglesia ni Cristo (INC) the second largest Christian denomination in the country, also has a large number of adherents with their large central temple in the city. The Church of Jesus Christ of Latter-day Saints has the Manila Philippines Temple and the Missionary Training Center located at Temple Drive Greenmeadows Subdivision of the city. A branch of Jesus Is Lord Church which known as JIL, a Christian megachurch. The Iglesia Filipina Independiente (Also known as the "Aglipayan Church") has three (3) parishes located in the city, the Parish of the Crucified Lord in Apolonio Samson, Parish of the Holy Cross in Escale, University of the Philippines Diliman and the Parish of the Resurrection in Balingasa. The Kingdom of Jesus Christ, The Name Above Every Name of Pastor Apollo C. Quiboloy is located at Novaliches (Central Office), EDSA–Cubao, Muñoz, and Fairview. The biggest concentration of the Jesus Miracle Crusade of Evangelist Wilde E. Almeda is also located in the city. The Philippine Branch office of the Jehovah's Witnesses is located along Roosevelt Avenue. The seat of the Presiding Bishop, the Cathedral of Sts. Mary and John of the Episcopal Church, the national offices of the United Church of Christ in the Philippines, the National Council of Churches in the Philippines as well as a number of Protestant seminaries are located in the city. The headquarters of the UCKG HelpCenter (Universal Church of the Kingdom of God) is located at the former Quezon Theater building. The headquarters of Bread of Life Ministries International is a Christian megachurch located in its own ministry center on Mother Ignacia Ave. in scout area. New Life NorthMetro, A satellite church of ANLCC (Alabang Newlife Christian Center) is located in Cinema 6, 4th level of Trinoma Mall. The Church So Blessed, also a Christian church, is located in Commonwealth Avenue. People of Grace Fellowship is another Christian church located in Kamuning Road, corner Judge Jimenez. Members Church of God International (Ang Dating Daan) are also established in the city. Nichiren Buddhists are also established in the city, with many thousands of adherents attending worship services at Soka Gakkai International (SGI) Philippines headquarters at Quezon Memorial Circle. Eastwood City is a mixed-use township development located in the Bagumbayan area. Araneta Center is one of the major commercial centers in Quezon City. The Quezon City Skyline heading to the Northern Part of the City. The commercial center of the city is in Cubao, Araneta Center, owned by the Araneta family, where many shopping malls can be found. Fiesta Carnival was an enclosed amusement park carnival located in the heart of the Cubao Commercial Center, later replaced by a branch of Shopwise, a local supermarket chain. Meanwhile, the Smart Araneta Coliseum is a venue for concerts as well as sports events. Quezon City is home to the Philippines' major broadcasting networks. Television companies such as ABS-CBN, RPN, GMA Network, INC TV, UNTV, Net 25, PTV, and IBC all have their headquarters in Quezon City. TV5 also had its headquarters in Quezon City since 1992, but it moved out to Mandaluyong City in 2013. However, its transmitter in Novaliches is still being used and operated by the network. Tomas Morato and Timog Avenues are the heart of a restaurant and entertainment row with a wide array of prices, cultures, and flavors while Banawe Avenue is dubbed as the "Autoparts Capital of the Philippines" and home to clusters of authentic Chinese restaurants aside from Binondo. The tallest building in the city is a 40-storey Eastwood Parkview located in Eastwood City. Eastwood City is a business district developed by Megaworld Corporation in Bagumbayan, Quezon City. Citibank Philippines, IBM Philippines, NEC Philippines, Canon Philippines and Mercury Drug Corporation are some of the companies headquartered in the cyberpark within the district. The city has several major educational institutions. Two of the most well-known are the University of the Philippines Diliman and the Ateneo de Manila University, both comprehensive research universities consistently ranked among the best in the country. Numerous Catholic Schools are also located in Quezon City such as Miriam College, St. Paul University of Quezon City, Siena College of Quezon City, etc. Other denomination also established their Schools in this city such as Trinity University of Asia run by Episcopalian and New Era University run by Iglesia ni Cristo. The presence of medical schools have made Quezon City a center of healthcare and medical education. These include Our Lady of Fátima University, FEU Nicanor Reyes Medical Foundation (independent medical school but related to Far Eastern University), St. Luke's College of Medicine, Capitol Medical Center Colleges, De Los Santos - STI College, New Era University College of Medicine, and the UERMMMC College of Medicine (independent but related to the University of the East). While it is located in Pasig, the Ateneo School of Medicine and Public Health (a constituent unit of the Ateneo de Manila University) lies close to its border with Quezon City. Other professional schools include the University of the Philippines College of Law (a constituent unit of UP Diliman) and the New Era University College of Law, both located in Diliman. The Technological Institute of the Philippines specializes in engineering and vocational education. The city government operates the Quezon City Polytechnic University, which has campuses in Novaliches, Batasan Hills, and Barangay Sto. Cristo. The Polytechnic University of the Philippines operates an extension campus in Barangay Commonwealth. Business and management schools located in the city include Entrepreneurs School of Asia located in Libis and National College of Business and Arts (NCBA) with campuses in Fairview and Cubao. Other colleges include Far Eastern University – FERN College (independent but related to Far Eastern University), Kalayaan College, the Central Colleges of the Philippines, Philippine Rehabilitation Institute, the main branch of the AMA Computer University, and numerous campuses of information technology colleges such as Asia School of Arts & Sciences (ASAS), Informatics International College, and STI College. Women's colleges such as Miriam College, Immaculate Heart of Mary College, and Saint Pedro Poveda College are located within city limits, with the last straddling the border of Quezon City and Pasig. The Catholic K-12 schools operated by religious orders include Angelicum College (Dominican), Ateneo Grade School and High School (Jesuit), School of the Holy Spirit (Missionaries Sisters Servants of the Holy Spirit), Siena College of Quezon City (Dominicans), St. Joseph's College of Quezon City (Franciscan), Lourdes School of Quezon City (Franciscan Capuchin), St. Mary's College of Quezon City (Religious of the Virgin Mary), St. Theresa's College of Quezon City (Missionary Sisters of the Immaculate Heart of Mary), and Stella Maris College (Dominican). Other Catholic schools operated by laypersons include Miriam College (formerly of the Maryknoll Sisters), St. Bridget School, Colegio de San Lorenzo, Flos Carmeli Institution, PAREF-Northfield School, PAREF-Rosehill School, Mater Carmeli School, School of Saint Anthony, and Sacred Heart Academy of Novaliches, while parochial schools include the Immaculate Conception Cathedral School in Cubao and the Good Shepherd Cathedral School in Fairview. Other private religious schools include New Era University (Iglesia Ni Cristo), Grace Christian College (evangelical Christian), Jubilee Christian Academy (evangelical Christian), Bethel Christian School of Fairview, Inc. & Bethel Christian School of Holy Spirit, Inc. (evangelical Christian) and Trinity University of Asia (Episcopalian). Notable secondary public schools include the Quezon City Science High School, Commonwealth High School, Ernesto Rondon High School, Don Alejandro Roces Sr. Science-Technology High School, Batasan Hills National High School, the University of the Philippines Integrated School, and Philippine Science High School Main Campus. The last two are operated independently of the Division of City Schools, with UPIS being managed by the UP College of Education and PSHS being run by the Department of Science and Technology. Research institutes in the city include the Philippine Heart Center, National Kidney and Transplant Institute, the Lung Center of the Philippines, the Philippine Nuclear Research Institute, and the Philippine Institute for Pure and Applied Chemistry. OB Montessori Center in Fairview, Quezon City is a school campus provided in Quezon City. Quezon City will host some matches in the 2023 FIBA Basketball World Cup at the Smart Araneta Coliseum. Two elevated light rail systems and one heavy rail system run through Quezon City: Line 1 – at EDSA (C-4) connecting North Avenue and Baclaran (Manila) Line 2 – at Aurora Boulevard (R-6) connecting Santolan (Marikina) and Recto (C-1 in Manila), and Line 3 – at EDSA (C-4) from Taft Avenue (R-2 in Pasay) to North Avenue. An elevated rail transit system (original Line 4) that was supposed to follow the general alignment of Quezon and Commonwealth Avenues (R-7) was shelved. In its place, a 22 kilometer rail system will be built. The Line 7 project will commence at North Avenue, connecting the Line 3 at its northern terminus. It will then go through Commonwealth Avenue, then through Regalado, Quirino Highway, ending in San Jose del Monte, Bulacan. The system has a proposed spur line to connect itself to Line 2 in Katipunan, passing through the University of the Philippines Diliman and Katipunan Avenue. An elevated Automated Guideway Transit system is currently under construction in UP Diliman. Public transportation within the city, like in most of the urban areas in the Philippines, is facilitated mostly using inexpensive jeepneys and buses. Tricycles give access to more secluded areas, while taxi cabs are available. Balintawak area will be the future northern terminus of Skyway in 2019. The stage 3 segment is the future elevated expressway connecting North Luzon Expressway and South Luzon Expressway in Buendia, Makati City. Tomás Morató, the first mayor of Quezon City. Like other cities in the Philippines, Quezon City is governed by a mayor and vice mayor elected to three-year terms. The mayor is the executive head and leads the city's departments in executing the city ordinances and improving public services. The vice mayor heads the legislative council consisting of 24 members. These councilors represent the six (6) legislative districts of the city. The council is in charge of formulating and enacting city ordinances. Quezon City, being a part of the Metro Manila region, has its mayor in the Metro Manila Council headed by the Metropolitan Manila Development Authority (MMDA). This council formulates development plans that seeks to solve the problems and improve the conditions in the metropolis. President Manuel L. Quezon acted as mayor from October 12 to November 4, 1939, pending the resignation from another position of his intended appointee, Tomas B. Morato. Since a president can, under Philippine law, hold multiple portfolios inferior to his office, Quezon took the position of mayor in a concurrent capacity. However, it is erroneous to view him as the first mayor, as a president holding a concurrent position is not listed in the roster of incumbents for those offices. Quezon City is made up of 142 barangays (the smallest local government units) which handle governance in a much smaller area. These barangays are grouped into the aforementioned legislative districts. Each district, in turn is represented in the House of Representatives. Peace and order, which includes traffic management of the city is administered by the Quezon City Department of Public Order and Safety, whose offices are found inside the Quezon City Hall Complex, is headed by retired QCPD District Director – Police Chief Superintendent Elmo San Diego. Emergency management for the city is administered by the Quezon City Disaster Risk Reduction Management Council headed by Mayor Herbert Bautista and Quezon City Disaster Risk Reduction & Management Office headed by its administrator; Dr. Noel Lansang. The QCDRRMO will move out of the DPOS Building once construction of the QCDRRMO Building, near Gate 7 of the City Hall Complex, is completed 4th Quarter of 2014. The National Headquarters of the Philippine National Police is located inside Camp Rafael Crame in Santolan, Quezon City and National Headquarters of the Bureau of Fire Protection is located in Agham road, Quezon City. Supporting the PNP in administration, rehabilitation and protection of prisoners within the city is the Quezon City Jail and is run by Officers and Enlisted Personnel of the Bureau of Jail Management and Penology. The BJMP National Headquarters is located along Mindanao Avenue in Project 8. The Quezon City Police District of the National Capital Region Police Office is responsible for law enforcement in the city. Police structure within Quezon City is centralized and its command center found inside Camp Karingal, Sikatuna Village, Quezon City. The QCPD Police sectors are divided to twelve (12) stations. The Quezon City Fire District is a division of the Bureau of Fire Protection National Capital Region which provides fire and emergency services to the city. Similarly, there are nineteen (19) fire sub-stations strategically located within the city. District Headquarters are located inside the Quezon City Hall Complex. The Armed Forces of the Philippines' General Headquarters is in Camp Emilio Aguinaldo in Murphy, Quezon City. The AFP Joint Task Force NCR is also housed inside Camp Aguinaldo. Several reserve units of the Armed Forces of the Philippines, which include the 1502nd Infantry Brigade (Ready Reserve), 201st Infantry Battalion (Ready Reserve), 202nd Infantry Battalion (Ready Reserve) of the Army Reserve Command and the 11th Air Force Group (Reserve) of the Air Force Reserve Command are also found in Quezon City and may render assistance to this local government unit during emergencies. The 105th Technical & Administrative Services Group (Reserve), specifically the 1st Technical & Administrative Services Unit (Ready Reserve) of the AFP Reserve Command provide technical assistance to these maneuver units. Collectively, these units function similar to that of the US National Guard. The Philippine Coast Guard Auxiliary, 106th Coast Guard Auxiliary Squadron, provides water search and rescue capabilities to disaster response agencies of Quezon City. It is headquartered at Barangay Quirino 2-C.
Quezon City is divided into six legislative districts, in turn subdivided in a total of 142 barangays. Each district is represented by six City Councilors, six representatives/congressmen, one from each district are elected as members of the National Legislature. The number of barangays per district is: District I, 37; District II, 5; District III, 37; District IV, 38; District V, 14; and District VI, 11; Although District II has the fewest barangays, it is the biggest in land area, including the Novaliches Reservoir. The La Mesa Watershed Reservation in Novaliches is the last forest of its size in the metropolis; the La Mesa Dam is an earth dam whose reservoir can hold up to 50.5 million cubic meters and occupying an area of 27 square kilometres (10 sq mi), it is also part of the Angat–Ipo–La Mesa water system which supplies most of the water supply of Metro Manila. Located at the southeastern corner of Quezon City, Bagumbayan is one of the newly developed commercial areas in Quezon City. The Eastwood City Business Center is situated here. It consists of several office and residential skyscrapers, including many local IT and consumer electronic firms. Numerous bars and restaurants have been put up since 2000 along E. Rodriguez Jr. Avenue (C-5). Many of which are open-air restaurants and coffee shops reminiscent of Paris boulevards, but with a modern architecture. With this, Bagumbayan is fast becoming one of the hippest areas for night entertainment, similar to the Malate and Ermita districts of Manila. West of Bagumbayan are many high-end gated communities like the Acropolis, Blue Ridge, Greenmeadows, White Plains, Corinthian Hills, and Corinthian Gardens. Further west are Camp Aguinaldo and Camp Crame. Camp Aguinaldo is the general headquarters of the Armed Forces of the Philippines while Camp Crame is the headquarters of the Philippine National Police. Bagumbayan also covers a sliver of Ortigas Center business district at the southeast corner of EDSA and Ortigas Avenue, where Robinsons Galleria, the EDSA Shrine, and Cyberpod Corinthian are located. North of Diliman lies the Commonwealth area, so named because of Commonwealth Avenue (R-7) (formerly called Don Mariano Marcos Avenue) which runs through its center. Barangays in this area include Batasan Hills, Barangay Commonwealth, Holy Spirit and Old Balara. This is primarily a residential area home to many subdivisions (residential associations), among these are Ferndale Villas, Don Antonio Royale, Don Antonio Heights, BF Homes QC, Ferndale Homes, Vista Real, Filinvest 1 and 2, New Capitol Estates and others. The government center in Quezon City was originally planned to be at what is now the location of the Quezon Memorial Circle, but it was then moved further north to where Batasan hills is now. Resultantly, there are important government establishments nearby such as the Commission on Audit of the Philippines, the Sandiganbayan, a special court with a rank equivalent to the Court of Appeals and the Batasang Pambansa Complex, which houses the lower house of the Philippine Congress. Schools within the Commonwealth area include the School of the Holy Spirit, Our Lady of Mercy School, Diliman Preparatory School, The Seed Montessori, Mary the Queen College, Capitol Hills Christian School, and the Asian Institute of Computer Studies. Ironically, this is also an area of sheer contrasts and a display of the acute economic differences in Metro Manila, with kilometers of shanty houses aligning the avenue on both sides. Parts of these are often being demolished just to be re-occupied by informal settlers soon after. Cubao, south of Diliman is an important commercial area. At its heart is the Araneta Center along EDSA (C-4) and Aurora Boulevard (R-6). It is a 35-hectare commercial estate owned and developed by the Araneta family. Department stores and retail centers can also be found here, such as Gateway Mall, Plaza Fair, Rustan's, Shopwise Supercenter, SM Cubao, Ali Mall, and Farmer's Plaza. At the center is Smart Araneta Coliseum, often called the Big Dome. Many musical concerts, ice shows, circus shows, religious crusades, wrestling, cockfighting, and basketball games are held in this 25,000-capacity coliseum. In the outskirts of Araneta Center is the Cubao Expo, an artists' colony and site of weekend flea markets. It is also a home to call centers like APAC, Telus, and Stellar. Stellar (Stellar Philippines Inc.) recently moved out of its Cubao site and moved to Eastwood City in 2010. It is Surrounded by Condominiums, BPO Offices, Schools, Transport Terminals, Residential and Commercial Properties. Cubao is also the home of Cubao Cathedral the seat of the Roman Catholic Diocese of Cubao, as well as the Iglesia ni Cristo chapel, Cubao. SM Hypermarket is located just outside the Araneta Center, along EDSA. Nightclubs also abound within the Cubao area, catering to a full range of tastes. There are residential areas ranging from the middle class to the upper class. Araneta Center is also home to the Consulate of the Republic of Colombia and The Colombian Embassy. North from Araneta Center along EDSA (C-4) are numerous bus terminals, which serves buses to most places in Luzon, Visayas or Mindanao. It is also an intersection point for two of city's commuter train lines (Lines 2 and 3). Named after the Tagalog word for the medicinal fern species Stenochlaena palustris, Diliman, located at the center of southern Quezon City, is where many government offices, including City Hall, are located. Diliman is home to several educational institutions such as the University of the Philippines Diliman, Quezon City Polytechnic University at Sto. Cristo, Diliman Preparatory School, New Era University FEU–FERN College, Jose Abad Santos Memorial School Quezon City, School of the Holy Spirit, Philippine Science High School Main Campus, Quezon City Science High School, the regional science high school in NCR, St. Mary's College of Quezon City, Quezon City High School, Don Alejandro Roces Science and Technology High School among others. At the center of Diliman lies the Quezon Memorial Circle, where the late President Manuel L. Quezon is interred. Around the monument is the two-kilometer Quezon Memorial Circle, also known as the Elliptical Road (R-7/C-5). The surrounding areas of Timog Avenue (South Avenue) and Tomas Morato Avenue in Diliman are a popular entertainment area. Located along these two avenues are numerous fine-dining restaurants and bars. Discothèques, karaoke joints and comedy bars provide patrons with all-night long recreation. It is home to many gay bars such as Chicos, Adonis, and Gigolo, which are popular for their lively night-time entertainment. South Triangle (the area bounded by Quezon Avenue (R-7), Timog Avenue (South Avenue) and EDSA) is the location of main studios of ABS-CBN (including the radio stations DZMM Radyo Patrol 630 and MOR 101.9) and GMA Network (including the radio stations Super Radyo DZBB 594 and Barangay LS 97.1). Most Filipino entertainment shows and movies are produced here, and it is also home to many Filipino celebrities; as a result it is often dubbed the "Filipino Hollywood". The studios and transmitter of RPN/CNN Philippines are located along Panay Avenue, in Barangay South Triangle. Several of the streets in the surrounding area were named in honor of the 22 Boy Scouts who died in a plane crash en route to joining the 11th World Scout Jamboree. A memorial stands in the center of a rotunda at the intersection of Timog and Tomas Morato Avenues, which accounts for the Timog area being called the 'Scout Area'. Near the scouting memorial is the location of the former Ozone disco, site of the worst fire in Philippine history. The Quezon City Hall, one of the tallest city halls in the country, is located along the Circle. Surrounding the city hall are spacious parks and open areas. The head offices of some national government agencies are located in Diliman. Near the Circle are many important health centers and institutions. Along East Avenue stand the Philippine Heart Center, the East Avenue Medical Center (EAMC), the National Kidney and Transplant Institute, and the Philippine Mental Health Association. Connecting with East Avenue is Victoriano Luna Avenue where the Armed Forces of the Philippines Medical Center is located. Along North Avenue is the Veterans Memorial Medical Center (VMMC) and the Philippine Medical Association. The Philippine Children's Medical Center and Lung Center of the Philippines are located along Quezon Avenue (R-7). Diliman is also home to the headquarters of most of the country's national television networks, most notably ABS-CBN, the first and largest television network in the country. The headquarters of GMA Network, which is also one of the largest television networks in the country, is also located in Diliman. PTV, RPN, IBC, and PBS also hold headquarters in Diliman. Most of the rest of the area is residential. Some villages in this portion of Diliman are Teachers Village, U.P. Village, and Sikatuna Village. Those closer to the University of the Philippines campus such as Teachers Village and U.P. Village remain mostly residential although there are two major secondary schools in the area namely Claret School of Quezon City and Holy Family School of Quezon City, and many have converted spare rooms into boarding facilities for out-of-town students attending schools in the area: UP, Ateneo, and Miriam College. The eastern edge of the Diliman area is roughly bound by Katipunan Avenue which passes in front of Ateneo and Miriam and runs behind the U.P. Diliman campus. The headquarters of the country's current power grid operator National Grid Corporation of the Philippines (NGCP) and owner National Transmission Corporation (TransCo), and National Power Corporation (NAPOCOR), operator and owner of transmission grid before the turnover of operations and ownership to TransCo in 2003, are also located in this district. The Galas-Santol District of Quezon City is located in its southeast border with the City of Manila. Located in the Galas area is the elementary school named after Manuel L. Quezon's wife, Aurora A. Quezon. Carlos L. Albert High School is named after a former vice mayor of the city. The SM City Sta. Mesa is located in the Galas-Santos District. It is the second of SM Supermall and the seventh SM branch developed and operated by SM Prime Holdings owned by Henry Sy Sr.. It has a land area of 3 hectares and has a gross floor area of an approximate 133,327 square meters. The mall opened to the public on September 28, 1990, and was the second SM Supermall to open after the largest SM Supermall in the Philippines at the time, SM City North EDSA. One of the vast areas in the Galas-Santol area is the Quezon Institute compound which was originally the site of Q.I. Hospital for tuberculosis stricken patients. The hospital was established under the auspices of the Philippines Tuberculosis Society. As of 2015[update], a large portion of the compound have ceased to form part of the hospital which remained operational up until now facing E. Rodriguez Avenue between Banawe and G. Araneta Avenue. The main road traversing the area is Santol Road which stretch from the Ramon Magsaysay Boulevard near Stop and Shop and V. Mapa in Manila up to the back gate of the Q.I. Compound in Bayani Street. Bayani Street often serve as alternate route during traffic along G. Araneta Avenue which allows motorist either to traverse Santol Road to exit at Ramon Magsaysay or going straight to exit either going to Balic-Balic, Manila or going to E. Rodriguez or Quezon Avenue and Sta. Mesa Heights area near Mabuhay (previously Welcome) Rotonda. Among the notable other landmarks in the area are the United Doctors Medical Center Hospital and College in Mabuhay Rotonda, the Our Lady of the Sacred School in Plaridel cor. Both G. Araneta and Banawe streets boast of the widest selection of stores for automotive related needs in Quezon City, as both areas are mere tricycle ride away from Galas-Santol area. The Galas Market serve as the main public market in the area. Jeepneys along Santol Road allows one to reach Quiapo via Stop and Shop and Mendiola in Manila. La Loma is located on the southwest area of Quezon City. It is composed of five barangays along the vicinity of its main streets, N.S. Amoranto Avenue (Retiro) and A. Bonifacio Avenue. The district is famed as the birthplace of many popular Filipino culinary figures and establishments, especially devoted to the lechon. The nearby La Loma Cemetery is named after the district. Loyola Heights, to the southeast of Diliman is Marikina City's gateway to Quezon City. The Aurora Boulevard (R-6) and Katipunan Avenue (C-5) provide easy access, but often experience traffic jams during rush hours. Also located in Loyola Heights is the Katipunan station of Line 2 , which runs in an east-west direction, providing rapid access to the cities of Manila, Quezon City, Marikina and Pasig, and San Juan. Passengers can transfer to Line 1 at Recto station in Manila, or to the Line 3 at Araneta Center–Cubao station. The main campus of Ateneo de Manila University and Miriam College are located in Loyola Heights. Loyola Heights also has numerous commercial study centers such as The Loyola Heights–Xavierville Kumon Center, Newton Study Center, LHSC, and others which offer after-school tutorial services. Loyola Heights is an upper middle-class and rich residential area that caters to students of the University of the Philippines Diliman, Ateneo de Manila University, and Miriam College, members of the schools' faculty and staff, and their families. La Vista Subdivision, north of Miriam College, is an upscale gated community where some of the country's top politicians own residences, including former President Gloria Macapagal-Arroyo, as well as many of the country's moneyed elite. Accessed through La Vista is Loyola Grand Villas, another upscale gated community. Across Katipunan, the main thoroughfare of the area, are Varsity Hills and Xavierville, both upper class and upper middle-class subdivisions. Near and even within these subdivisions, and right beside La Vista, are some squatters' settlements, making the Loyola Heights area a place of mixed socio-economic classes. Facade of St. Paul University, right along Gilmore Ave.
New Manila is located on west central portion of the city. The largely residential district takes its name from Quezon City's neighbour to the southwest, the City of Manila. The area was first settled after the Second World War by affluent families who wished to escape the stress of living in the capital. As a result, many of the houses here stand on lots measuring 500 square meters and above. The main thoroughfares are Aurora Boulevard, Gilmore Avenue, and Eulogio Rodriguez Sr. Avenue. Aurora Boulevard begins at the Quezon City – Manila border and reaches New Manila upon crossing EDSA. Gilmore crosses Ortigas Avenue, giving it access to Mandaluyong, Pasig, and San Juan, Metro Manila. Eulogio Rodriguez, Sr. Avenue diverges from Aurora Boulevard a few meters from EDSA. Aurora Boulevard is the site of Broadway Centrum, where the first GMA Network entertainment shows and noontime show Eat Bulaga! were shot; Broadway Centrum was also given to TV5 for its TV shows until it is moved out in the site to TV5 Media Center at Mandaluyong City. St. Paul University of Quezon City stands at the corner of Aurora Boulevard and Gilmore Avenue, across a row of shops specializing in computer equipment, and a branch of SYKES Asia. Kalayaan College, meanwhile, stands at the corner of Aurora Boulevard and Mangga Road. Trinity University of Asia, St. Joseph's College of Quezon City, the Christ the King Mission Seminary, and St. Luke's Medical Center are all located along Eulogio Rodriguez Avenue, as are the Quezon Institute and the Philippine Charity Sweepstakes Office. Informatics Sta. Mesa, an international computer school that offers higher education programs and short courses is also located along Aurora Boulevard near Araneta Avenue. The main office of BusinessWorld, Southeast Asia's first business daily, is along Balete Drive Extension. Also located near New Manila is Quezon City's "Funeral Home Row", Araneta Avenue. This is attributed to the unusually high concentration of funeral homes in the area. Curiously, also located along Araneta Avenue is Sanctuarium, a multi-storey columbarium and funeral home. Balete Drive, between Aurora Boulevard and Eulogio Rodriguez Sr. Avenue, is also the setting for many urban legends. The cathedral of the Roman Catholic Diocese of Cubao is located along Lantana Street, near Eulogio Rodriguez, Sr. Avenue. The offices and studios of MOWELFUND are located a few blocks from the cathedral. New Manila is also the site of the official residence and workplace of the Vice President of the Philippines, Quezon City Reception House. "Novaliches" redirects here. For the Spanish general, see Manuel Pavía y Lacy. La Mesa Watershed and Eco-Park. Novaliches was named after the Marquis of Novaliches, Manuel Pavía y Lacy, the general who protected Queen Isabella of Spain from her uncle who tried to usurp the Spanish crown, and supporter of her son, King Alfonso, upon the monarchy's restoration. He was made the first Marquis of Novaliches, a title bestowed with Grandeza de Espana (Grandee of Spain--- first class rank among the nobility), in the 1840s. Novaliches or "New Liches" came from an old district of Granada, Spain also known as "Liches" where Manuel and his ancestors, the Pavías, originate. By the early 1850s, he reluctantly accepted the post of Governor General of the Philippines. He ruthlessly crushed the rebellion started by José Cuesta of Cavite, a Spanish mestizo who rounded carbineros and natives to fight the Spanish military government, one of the many uprisings where even half-Spanish Filipinos began revolting. Novaliches is Quezon City's northernmost district and is primarily residential. The La Mesa Dam Watershed occupies the eastern portion. The La Mesa Dam supplies much of northern Metro Manila's water supply. Adjacent to the watershed is the La Mesa Watershed and Eco-Park, where one can stroll and unwind at Metro Manila's only forest space. Also located in the park are convention centers, picnic areas, swimming pools, an orchidarium, and a large lagoon for boating activities. It was also the site of the rowing and dragon boat events for the 2005 Southeast Asian Games. Rowing is regularly done here. Also located here are five big malls: SM City Fairview, Fairview Terraces, Robinsons Novaliches, SM City Novaliches, and Novaliches Plaza Mall. Novaliches town proper is the home of several educational institutions, notably St. John of Beverley, STI College Novaliches, both near SM City Novaliches, Maligaya Elementary School and Maligaya High School in Maligaya Park Subdivision, just near SM City Fairview, the Metro Manila College (MMC), formerly known as Novaliches Academy (NA), Quezon City Polytechnic University at San Bartolome (The University's Main Campus), Bestlink College of the Philippines and Colegio de Sta. Teresa de Avila in Kaligayahan, and Sto. Niño de Novaliches School. Barangay Fairview is home to the Far Eastern University – Nicanor Reyes Medical Foundation, National College of Business and Arts, Our Lady of Fatima University Lagro Campus, School of Saint Anthony (formerly known as St. Anthony Learning Center) in Lagro, Mater Carmeli School in Sacred Heart Village, Good Shepherd Cathedral School in Fairview, The Lord of Grace Christian School in East Fairview, Divine Grace School in Maligaya Park Subdivision, just near SM Fairview, and Novaliches Cathedral (Cathedral Shrine and Parish of the Good Shepherd), the seat of the Roman Catholic Diocese of Novaliches. Novaliches used to be the home of TV5, one of the country's largest television networks, which moved to Mandaluyong in 2013. The transmitter located inside the Novaliches facility, however, is still used. In 1999, a plebiscite was held among the voters of Quezon City to determine the cityhood of Novaliches. The proposed creation of "Novaliches City" would have resulted in the secession of 15 barangays from Quezon City. At the plebiscite's end, votes that were against the separation heavily outnumbered those that were in favor. Novaliches is also home to the oldest church of the Diocese of Novaliches and the town itself, the Parish and Shrine of Our Lady of Mercy or the Nuestra Senora de las Mercedes. The parish was founded on September 24, 1856 by Padre Andres Martin, O.S.A. Nearby the Church of Las Mercedes is the huge tree where Andres Bonifacio and Tandang Sora held meetings to fight in the revolution against Spain. It is located in the grounds of Metro Manila College in Barangay Kaligayahan and has withstood typhoons for more than 200 years. Founded as a pueblo by Saint Pedro Bautista in 1590, San Francisco del Monte may be considered Quezon City's oldest district. The original land area of the old town of San Francisco del Monte was approximately2.5 square kilometres (1.0 sq mi) and covered parts of what is currently known as Project 7 and 8 and Timog Avenue. It was later absorbed by Quezon City. It featured a hilly topography with lush vegetation and mineral springs, in the midst of which the old Santuario de San Pedro Bautista was built as a retreat and monastery for Franciscan friars. Currently, it is composed of Barangays San Antonio, Paraiso, Paltok, Mariblo, Damayan and Del Monte. San Francisco del Monte is also referred to as S.F.D.M.. The district is bisected by its two major thoroughfares, Roosevelt Avenue and Del Monte Avenue. It is bounded by West Avenue on the east, Epifanio De Los Santos Avenue on the north, Quezon Avenue on the south, and Araneta Avenue on the west. The studios and transmitter of IBC are located along Roosevelt Avenue, in San Francisco del Monte. Today, it is a heavily populated district with a mix of residential, industrial, and commercial areas. The most prominent educational institutions located in the area are Siena College of Quezon City, Angelicum College, and PMI Colleges, while Fisher Mall is the largest commercial establishment. Santa Mesa Heights is said to be where many middle-class and upper-middle-class families reside. Most of the areas in Santa Mesa Heights are residential. It is also home to the National Shrine of Our Lady of Lourdes and The National Shrine of Our Lady of La Naval (Sto. Domingo Church). Angelicum College, Lourdes School of Quezon City, and St. Theresa's College of Quezon City are three prestigious private Catholic schools to be found here. Philippine Rehabilitation Institute and Capitol Medical Center Colleges are also located here. This is also a location of Philippine Orthopedic Center located along Banawe Avenue corner Maria Clara Street. And also the headquarters of Mareco Broadcasting Network (Crossover 105.1) located along Tirad Pass street. The main thoroughfares of this area are Banawe, D. Tuazon, Mayon, N.S. Amoranto (formerly called Retiro), Del Monte, Sgt. Rivera, and Andres Bonifacio Avenue. For the hero of the Philippines nicknamed Tandang Sora, see Melchora Aquino. This is located between Commonwealth to the east, North Ave to the south, San Francisco del Monte (Frisco) Avenue to the west, and Fairview–Sauyo to the north. It takes its name from the "Grand Old Lady of the Revolution", Melchora Aquino or Tandang Sora, whose remains lie at the Tandang Sora National Shrine on Banlat Road, Barangay Tandang Sora. The area is primarily residential with Projects 6 and 8 located here, as are other subdivisions, like Town & Country Gardenville, San Pedro Subdivisions, National Power Corporation or NPC Village, National Irrigation Administration or NIA Village, Reymar Subdivision, Philand Subdivision, Villa Corrina,Pleasantview Subdivision, San Miguel Village, Gloria Subdivisions, Jem Subdivisions, Corazonville subdivision, Villa Concepcion, Villa Lourdes, Macaya street, and many more. A large portion of Tandang Sora district is Barangay Bahay Toro, where a historic site of the Philippine Revolution known as Pugad Lawin is located. There are some industrial facilities especially near the Mindanao Avenue area. Culiat, a Muslim compound, is also to be found here, as are the central offices of the Iglesia ni Cristo, New Era University and the studios and transmitter of Net 25 INC TV 49, Radyo Agila, Pinas FM and INC Radio of the Eagle Broadcasting Corporation and Christian Era Broadcasting Service International. The transmitter of GMA Network and Barangay LS 97.1 is located near Culiat. Many educational centers are also within the area such as Colegio De San Lorenzo, St. Patrick School, St. James College, Maria Montesoori, and etc.. Also in the area are Congressional Avenue, Visayas Avenue, and Mindanao Avenue (forming part of C-5). Project 8 (Barangays Bahay Toro, Baesa and Sangandaan). Ugong Norte, though some of its area is shared with Bagumbayan, is the boundary of Quezon City with Pasig and houses the posh villages of Acropolis Subdivision, Corinthian Gardens and Green Meadows. Found along ADB avenue, the headquarters of the Asian Development Bank is partly located within area of Ugong Norte. Robinsons Galleria and the Crowne Plaza Manila can be found along Ortigas avenue near the EDSA Shrine. Saint Pedro Poveda College sit beside Robinsons Galleria along EDSA. Quezon City is the setting for much of F.H. Batacan's novel Smaller and Smaller Circles. Cubao Landscape, by Fernando Amorsolo, 1924. Novaliches Landscape, by Fernando Amorsolo, 1925. ^ San Diego, Jr., Bayani (July 21, 2012). "QC, 'City of Stars,' goes indie". Inquirer Entertainment. Philippine Daily Inquirer. Archived from the original on April 19, 2019. Retrieved April 19, 2019. ^ "Province: NCR, SECOND DISTRICT (Not a Province)". PSGC Interactive. Quezon City, Philippines: Philippine Statistics Authority. Retrieved November 12, 2016. ^ a b Census of Population (2015). "National Capital Region (NCR)". Total Population by Province, City, Municipality and Barangay. PSA. Retrieved June 20, 2016. ^ "Quezon City". The American Heritage Dictionary of the English Language (5th ed.). Boston: Houghton Mifflin Harcourt. 2014. Retrieved April 18, 2019. ^ "Quezon City". Collins English Dictionary. HarperCollins. Retrieved April 18, 2019. ^ "Quezon City" (US) and "Quezon City". Oxford Dictionaries. Oxford University Press. Retrieved April 18, 2019. ^ "Quezon City". Merriam-Webster Dictionary. Retrieved April 18, 2019. ^ "Part II". Quezon City at 75 Resurgent & Resilient. Erehwon Artworld Corporation for the Local Government of Quezon City through the Communications Coordination Center. 2014. pp. 131–133. ISBN 9789719566632. ^ a b "History of Quezon City Public Library" (PDF). November 21, 2006. Archived from the original (PDF) on September 24, 2015. Retrieved July 25, 2014. ^ "Presidential Decree No 940, s. 1976". Official Gazette of the Philippines. Archived from the original on April 5, 2019. Retrieved March 12, 2019. ^ a b c d e f g h i j Web Admin. "Milestones in History". Retrieved September 14, 2015. ^ a b c d e f g h i j "Quezon City Brief History, Philippines (Official Website of PhilTravelcenter.com – Quezon City Metro Manila, Philippines)". Retrieved September 14, 2015. ^ "An Update on the Earthquake Hazards and Risk Assessment of Greater Metropolitan Manila Area" (PDF). Philippine Institute of Volcanology and Seismology. November 14, 2013. Archived from the original (PDF) on June 24, 2016. Retrieved May 16, 2016. ^ "Enhancing Risk Analysis Capacities for Flood, Tropical Cyclone Severe Wind and Earthquake for the Greater Metro Manila Area Component 5 – Earthquake Risk Analysis" (PDF). Philippine Institute of Volcanology and Seismology and Geoscience Australia. Retrieved May 16, 2016. ^ "Science Garden Quezon City Climatological Normal Values". Philippine Atmospheric, Geophysical and Astronomical Services Administration. Archived from the original on September 23, 2018. Retrieved September 23, 2018. ^ "Science Garden Quezon City Climatological Extremes". Philippine Atmospheric, Geophysical and Astronomical Services Administration. Archived from the original on September 23, 2018. Retrieved September 23, 2018. ^ Census of Population and Housing (2010). "National Capital Region (NCR)". Total Population by Province, City, Municipality and Barangay. NSO. Retrieved June 29, 2016. ^ Censuses of Population (1903–2007). "National Capital Region (NCR)". Table 1. Population Enumerated in Various Censuses by Province/Highly Urbanized City: 1903 to 2007. NSO. ^ "Province of Metro Manila, 2nd (Not a Province)". Municipality Population Data. Local Water Utilities Administration Research Division. Retrieved December 17, 2016. ^ Mercurio, Richmond S. (September 19, 2015). "Philippine cities with over 1M population to nearly triple by 2025". Philippine Star. ^ "Profile of Makati City" (PDF). Makati City Government. ^ Central Intelligence Agency. "The World Factbook". Philippines – People and Society. Archived from the original on January 11, 2010. Retrieved January 27, 2014. ^ Manila : Republic of the Philippines, Philippine Statistics Authority (2010). "The Philippines in figures". WorldCat. ^ a b "Kapatid network's new home | Entertainment, News, The Philippine Star | philstar.com". philstar.com. Retrieved July 25, 2014. ^ Daphne J. Magturo. "Quezon City moves to replace Manila as country's capital". Retrieved September 14, 2015. ^ "Eastwood Parkview Newly Turovered Condominium for Sale in Quezon City | Megaworld Corporation". mycondo.com.ph. Retrieved July 25, 2014. ^ a b "Department of Public Order and Safety". quezoncity.gov.ph. Retrieved July 25, 2014. ^ a b c Administrator. "QC Government Directory". Archived from the original on March 12, 2018. Retrieved September 14, 2015. ^ "Policy Statement on Disaster-Risk Reduction and Environment Management". quezoncity.gov.ph. Retrieved July 25, 2014. ^ a b "QC activates Disaster Risk Reduction and Management Office". rr-f.ch. Archived from the original on July 28, 2014. Retrieved July 25, 2014. ^ "PNP.GOV.PH: Philippine National Police". PNP.GOV.PH. Retrieved September 14, 2015. ^ "BFP : Bureau of Fire Protection – To Save Lives and Properties". bfp.gov.ph. ^ "BJMP Official Website". Retrieved September 14, 2015. ^ "BJMP Official Website". bjmp.gov.ph. Retrieved July 25, 2014. ^ a b "Official Page of the Quezon City Police District". Retrieved September 14, 2015. ^ "Home". Archived from the original on October 3, 2014. Retrieved September 14, 2015. ^ "Facebook". Retrieved September 14, 2015. ^ John Pike. "Armed Forces of the Philippines (AFP)". globalsecurity.org. Retrieved July 25, 2014. ^ "General Headquarters". afp.mil.ph. Retrieved July 25, 2014. ^ "Account Suspended". Archived from the original on September 29, 2015. Retrieved September 14, 2015. ^ "11th Air Force Group Reserve". 11th Air Force Group Reserve. Retrieved September 14, 2015. ^ "AFP reservists to help LGUs in disaster response – Philippines | ReliefWeb". reliefweb.int. Retrieved July 25, 2014. ^ "Philippine Coast Guard Auxiliary (PCGA)". Philippine Coast Guard Auxiliary (PCGA). Retrieved September 14, 2015. ^ "Quezon City Public Library – Quezonian Newsletter". Archived from the original on September 24, 2015. Retrieved September 14, 2015. ^ "Our Awesome Planet: [Travel] Cubao Expo: Secrets of Cubao eXpo". ourawesomeplanet.com. Retrieved July 25, 2014. ^ "Welcome to TELUS International Philippines | TELUS International Philippines". telusinternational.com.ph. Retrieved July 25, 2014. ^ "How to get to Stellar Cubao? @ Call Center Beat". callcenterbeat.com. Retrieved July 25, 2014. ^ "How to go to Stellar Libis? @ Call Center Beat". callcenterbeat.com. Retrieved July 25, 2014. ^ "Em Esber Blog 1: MRT Line 2 System – The Purple Line". jibrael.blogspot.com. Retrieved July 25, 2014. ^ "Non-Timber Forest Products Exchange Programme". Retrieved September 14, 2015. ^ "Update Magazine Sept-Dec 2014". Retrieved September 14, 2015. ^ "ABS-CBN: The biggest TV Network in the Philippines and in Asia | Showbiz – TV | PinoyExchange". pinoyexchange.com. Retrieved July 25, 2014. ^ "ABS-CBN's Firsts in the Philippine Broadcasting History (Part 1) " Clarence's Journey on Everyday Lives". rency0722.wordpress.com. Retrieved July 25, 2014. ^ "SM City Sta. Mesa". SM Prime Holdings Mall List. SM Prime Holdings. Archived from the original on July 8, 2014. Retrieved January 3, 2014. ^ "La Loma Lechon, Quezon City. | Philippine Travel Blog – The Travelers Guide to Philippine Destinations". Pinoytravelblog.com. March 29, 2006. Archived from the original on December 30, 2010. Retrieved May 25, 2012. ^ "Complete creative freedom in TV5 shows – INQUIRER.net, Philippine News for Filipinos". showbizandstyle.inquirer.net. Archived from the original on March 6, 2014. Retrieved July 25, 2014. ^ BusinessWorld Publishing Corporation. "BusinessWorld Online Edition | Philippine Business News & Analysis: About BusinessWorld". bworldonline.com. Archived from the original on October 6, 2014. Retrieved July 25, 2014. ^ BusinessWorld Publishing Corporation. "BusinessWorld Online Edition | Philippine Business News & Analysis: Write Us". bworldonline.com. Archived from the original on October 7, 2014. Retrieved July 25, 2014. ^ "TV5: New Year, New Home | Entertainment, News, The Philippine Star | philstar.com". philstar.com. Retrieved July 25, 2014. ^ Ronald Echalas Diaz, Chan Robles & Associates Law Firm. "Philippine Laws, Statutes, and Codes – Chan Robles Virtual Law Library". chanrobles.com. Retrieved July 25, 2014. ^ "Samsom vs Aguirre : 133076 : September 22, 1999 : J. Quisumbing : En Banc". sc.judiciary.gov.ph. Retrieved July 25, 2014. ^ "Sister Cities". Local Government of Quezon City. Retrieved August 22, 2016. ^ a b c d e f g h i j k "Roxas City: Quezon City's New Sister City". The Local Government of Quezon City. March 19, 2013. Retrieved February 4, 2015. ^ Tayona, Glenda; Silubrico, Ruby (August 25, 2018). "Iloilo to showcase culture to 'sister cities' tonight". Panay News. Archived from the original on April 9, 2019. Retrieved April 9, 2019. ^ "List of Sister City Affiliations with Japan (by country): Philippines". Singapore: Japan Council of Local Authorities for International Relations (CLAIR, Singapore). February 29, 2012. Retrieved February 4, 2015. ^ "Sister cities, towns and villages of Kyoto Prefecture". Kyoto Prefecture Website. Retrieved February 5, 2015. ^ a b c d e f g h i j k l "Sister Cities". The Local Government of Quezon City. Archived from the original on October 1, 2017. Retrieved April 9, 2019. ^ "Quezon City, Yangon ink sister city deal". Manila Bulletin. Retrieved February 7, 2017. Quezon City Government, Milestones in History, 2014. Wikimedia Commons has media related to Quezon City. Wikivoyage has a travel guide for Quezon City. New Manila House, a mid-twentieth-century photo of a house, which was demolished in 2018, at 27 Gilmore Avenue corner 6th Street. Although the perimeter fence has been raised and is now made of concrete, the original Art Deco fenceposts are still recognizable.